The Pelandale Specialty Care Center in Modesto opened to the public in February. 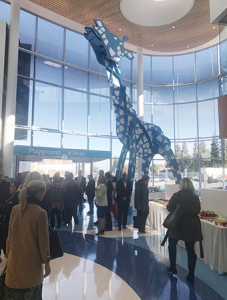 Valley Children’s Healthcare officially opened the Pelandale Specialty Care Center in February with an open house that highlighted the facility’s features and options for treating their young patients. More than 300 people attended, including Modesto Mayor Ted Brandvold, Stanislaus County Supervisor Terry Withrow, Stanislaus Community Foundation CEO Marian Kaanon, grateful families, community leaders, Valley Children’s representatives and Oakland Raiders Quarterback Derek Carr. Pelandale Specialty Care Center currently offers outpatient services in the following pediatric specialties: Cardiology, Endocrinology, Gastroenterology, Hematology, Nephrology, Neurology, Orthopaedics, Otolaryngology, Pediatric Surgery, Plastic Surgery, Pulmonology and Urology. 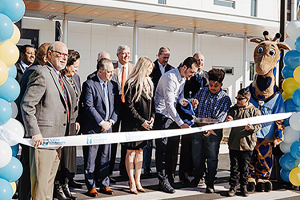 The grand opening of the Pelandale Specialty Care Center in Modesto included a ribbon-cutting ceremony with Oakland Raiders Quarterback Derek Carr. 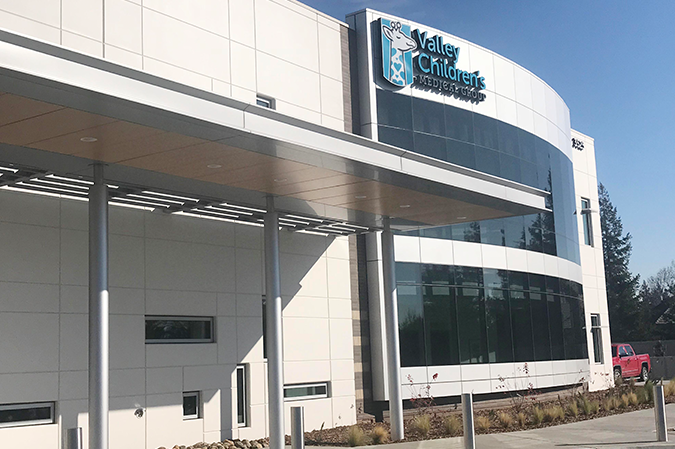 The 40,000-square foot facility was made possible by a $33 million investment by Valley Children’s in an ongoing effort to bring their services to more families in the Central Valley. 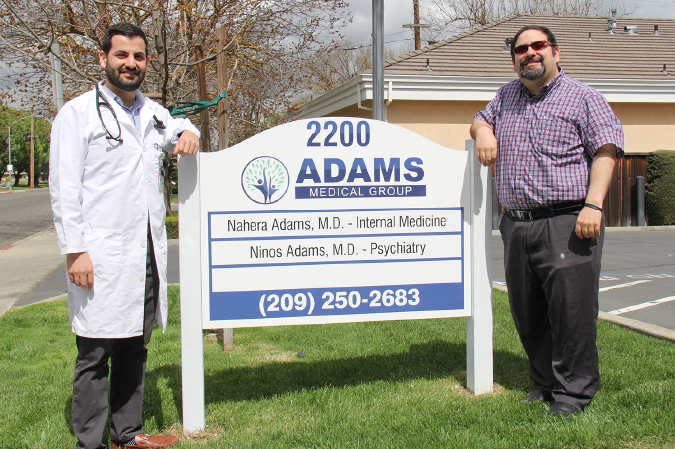 The Pelandale site replaces a smaller facility that was located in McHenry Village in Modesto. 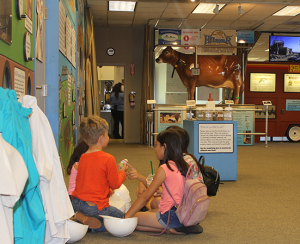 The Center made sure to include some features that would appeal to children, like a virtual hot air balloon ride over the town, a spongy play area, a faux rock garden, and a giant metal bobbing giraffe. 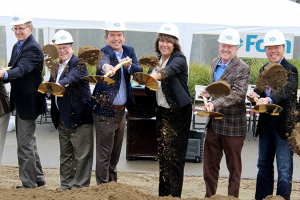 Blue Diamond President and CEO Mark Jansen and Turlock Mayor Amy Bublak (pictured center) break ground on the Turlock Blue Diamond facility’s expansion. Less than seven years after Blue Diamond Growers broke ground on its Turlock facility, representatives from the almond marketer and processor once again pulled out the golden shovels on the morning of Jan. 29 as they celebrated the plant’s expansion. 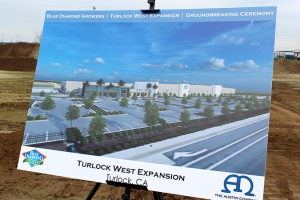 The 52,000 square foot expansion of Turlock’s Blue Diamond facility will provide more space for the rapidly-expanding company by way of a new line for almond beverage production. 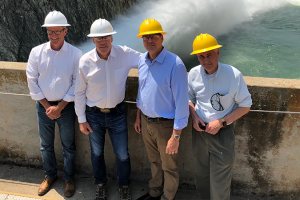 Stanislaus County officials and outgoing Congressman Jeff Denham discuss the North County Corridor project that is expected to make a major impact on moving goods and products through the region. The U.S. Department of Transportation has awarded four California projects $72.5 million in grants from its BUILD Transportation Discretionary Grant program, formerly known as TIGER grants. Among the projects in line for funding is the North County Corridor. In November 2016, residents of Stanislaus County voted overwhelmingly to approve Measure L, instituting a special 25-year, one-half cent sales tax increase for local transportation improvement projects. This designated Stanislaus a “Self-help County,” creating opportunities for federal funding like the TIGER and BUILD grants. “The passage of Measure L and becoming a Self-help County has made an enormous difference. 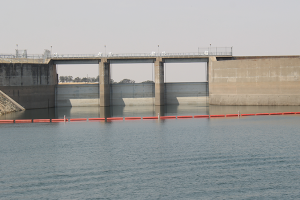 We are able to compete well with leveraging funding,” said Vito Chiesa, Stanislaus County Board of Supervisors. Congress tripled the funding for the program this year to $1.5 billion. California’s $72.5 million is eight times the amount received last year. “This is outstanding for Stanislaus County. 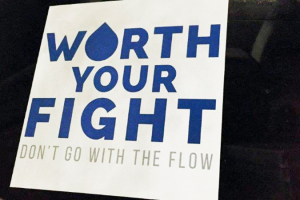 The North County Corridor is a critical inter-regional connectivity project that will positively impact the movement of our goods and services,” said Supervisor Terry Withrow, who has been a leader for regional projects, ensuring their forward momentum. “Investment in our transportation infrastructure is necessary for California’s long-term economic growth,” added Senator Feinstein. “These grants, combined with state and private funding, will ensure these vital projects can move forward. •$20 million for Stanislaus County to build three miles of the new SR 108 North County Corridor, a six-lane expressway. • $15 million for San Francisco roadway improvements on Market Street between 6th and 8th streets, including roadway resurfacing, streetcar track replacement, upgrading traffic signals and a new F-line streetcar turnaround loop at McAllister Street and Charles J. Brenham Place. •$20 million for Imperial County to widen the existing bridge at the Calexico Border Patrol Station to accommodate two additional northbound commercial truck lanes, two additional northbound passenger vehicle lanes, and bicycle and pedestrian improvements. 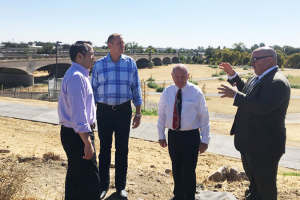 • $17.5 million for Kern County to widen five miles of Route 46 to four lanes in each direction, add one mile of bike lanes and sidewalks, and build a new bridge. 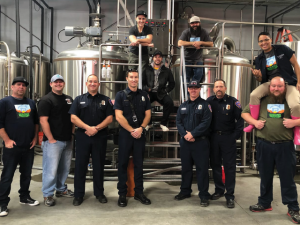 Ceres fireighters joined the staff at Blaker Brewing on Nov. 27 as they started their brew of Sierra Nevada’s Resilience IPA to raise funds for victims of the Camp Fire in Butte County. Breweries throughout the 209 have joined dozens of other beer makers across the country in brewing up a special batch of Sierra Nevada Brewing Co.’s Resilience that will be released this month — with all proceeds going to help victims of the Camp Fire in Butte County. Chico-based brewery Sierra Nevada Brewing Co. set up a Camp Fire Relief Fund through the Golden Valley Bank Community Foundation and seeded the fund with a $100,000 donation. 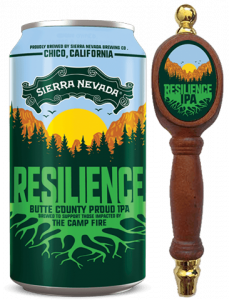 Sierra Nevada then reached out to its fellow brewers across the country and asked if they could help with the fundraising efforts through the release of the Resilience Butte County Proud IPA. Over 1,000 breweries have answered Sierra Nevada’s call for assistance — including 13 in the 209 area code. Dust Bowl Brewing Co. in Turlock and Blaker Brewing in Ceres are two of the local businesses willing to brew for a good cause. “Dust Bowl Brewing Co. had already been pondering how we could help, so the invitation could not have been timelier,” said Dust Bowl’s public relations manager Michelle Peterson. On Giving Tuesday, Nov. 27, Dust Bowl and the other participating craft breweries across the country brewed the Resilience Butte County Proud IPA, with Sierra Nevada providing the recipe and working with suppliers to provide discounted ingredients. Dust Bowl Brewing Co.’s two Turlock locations will release the Resilience IPA on Dec. 19. Dust Bowl Brewing Co. brewed a 10-barrel batch (approx. 250-300 gallons), which will be released at a special fundraising event on Dec. 19. The Resilience IPA will then be on tap in Dust Bowl’s two Turlock taprooms. Channel Brewing Co. in Stockton (110 N. San Joaquin St.) also participated in the brew and announced their batch of the Resilience IPA would be released Dec. 21, while Persuasion Brewing Co. in Modesto (500 7th Street) raised over $1,500 for Camp Fire victims during a fundraiser on Nov. 27 — before they had even begun their brew. “We know that the rebuilding process will take time, but we’re in this for the long haul. Our hope is to get Resilience IPA in taprooms all over the country to create a solid start for our community’s future,” said Sierra Nevada founder Ken Grossman in a release. Dust Bowl has two taprooms located at 200 W. Main St. and 3000 Fulkerth Rd. in Turlock. 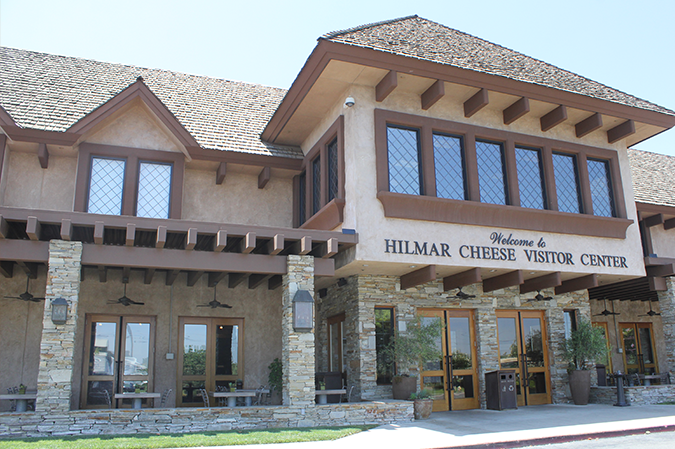 Blaker Brewing is located at 1063 Montclaire Dr., Ceres. Other participating breweries in the 209 include River Rock Brewery in Galt (807 C St.), Five Window Beer Co. in Lodi (9 W. Locust St.), High Water Brewing in Lodi (927 Industrial Way), Lodi Beer Company (105 South School St.), Brethren Brewing Company (1430 Quincy Ave.), Last Call Brewing Company in Oakdale (944 Shepard Ct.) and G3Enterprises in Modesto (502 E. Whitmore Ave.). For a full map of participating breweries, visit sierranevada.com. with scholarships so they can further their education. Right about now Emmanuel Escamilla is probably thinking he’s never going to get out of Texas. 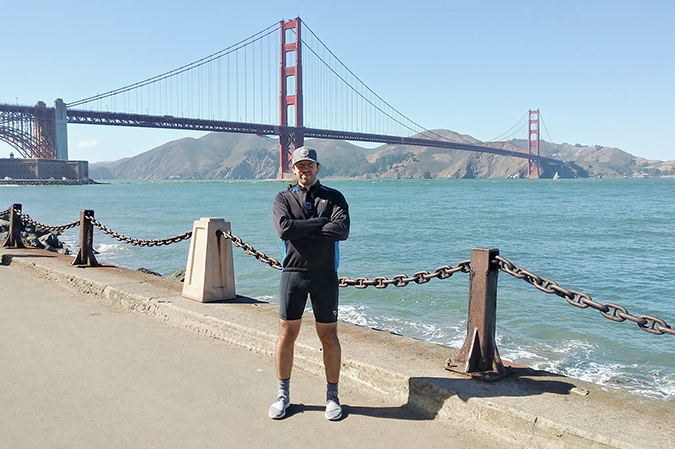 Escamilla is the founder of the Modesto-based CodeX Program is currently biking across the United States to support first-generation students with scholarships so they can further their education. His journey began in September in San Francisco and will end sometime in November some 3,000 miles away from his starting pointing at St. Augustine, Florida. Escamilla, a 2018 graduate from Harvard University, will be taking a year off to pursue this journey before attending business school next fall. He’ll be traversing through nine states over 50 days on this particular quest. CodeX was founded with a single mission: to make tech education accessible in low-income communities. CodeX provides college and pre-career exposure to the tech sector for underserved students in the Central Valley. Through high energy, hands-on educational programs, CodeX equips students with foundational knowledge in computer science, inspiring them to pursue current opportunities to secure economic mobility. In furthering its mission, CodeX has worked to create school ecosystems to support students in their learning journey. By providing training opportunities for teachers and curriculum to assist school districts implement tech-focused courses, the hope of making tech education accessible in low-income communities is becoming a reality. Since its founding in 2015, the nonprofit has garnered success by being awarded the Westly Prize for Young Innovators in California in 2016, and for its students winning the Congressional App Challenge in 2016 and 2017. Now CodeX seeks to further its mission by inspiring students to finish their educational journey, by being the first in their family to attend college. Escamilla is trying to make the way easier by fundraising to create a scholarship fund dedicated to students who will be the first in their family to attend college. As a first-generation student himself, he understands the difficulties of navigating a path to college. This was one of the reasons for the founding of the CodeX Program. To donate or for more information, visit codexinspire.com. That’s the message spreading through the city of Stockton as the city welcomes it’s first NBA G-League franchise — the Stockton Kings. In April the Stockton City Council unanimously approved a lease agreement allowing the Sacramento Kings G League team to play games at Stockton Arena beginning this fall. “It’s going to be fantastic both for our organization, as well as the Sacramento community and the Stockton community by increasing the connectivity between the two teams to keep building on the momentum that we’ve started the last couple of years with the G-League team,” said Stockton Kings General Manager Anthony McClish. The NBA G League is the NBA’s official minor league, preparing players, coaches, officials, trainers, and front-office staff for the NBA while acting as the league’s research and development laboratory. Stockton is now one of 27 cities with an NBA G-League franchise. The Kings G League team has a three-year agreement that will see them play 25 home games at Stockton Arena per year. The lease for the facility is $9,000 a game or $225,000 for the first season, and then will rise to $236,250 for the 2019-20 season and $247,500 for 2020-21. The team had previously been based in Reno and were known as the Bighorns. The team will practice and reside in Sacramento and will travel by bus to the games in Stockton. Sacramento Kings President John Rinehart praised the move to the 209 region and said it was a chance for the fervent fan base to grow beyond the boundaries of Sacramento. “To have a strong foot print and foothold in the Central Valley and bring what our passionate fan base does in Sacramento down here to the Central Valley, it just gives us another opportunity to use our sport as the agent of change,” Rinehart said. In May, the franchise unveiled the team’s new logos and identity at a school rally at Hong Kingston Elementary School in Stockton. To celebrate its new identity, the Stockton Kings – along with the help of the Sacramento Kings – held a community action day following the school rally where the team hosted a Jr. Kings Clinic for select Stockton Unified School District students, surprise residents and businesses with T-shirts, shopping bags and more Stockton Kings gifts. The move to the 209 will bring an economic boost to the city of Stockton, as the city will receive a portion of ticket sales. In return, the city will upgrade the locker rooms and find free on-site parking for players and staff. This July, Kings NBA G League players will join parent club rookies and sophomores for the annual NBA Summer League in Las Vegas. 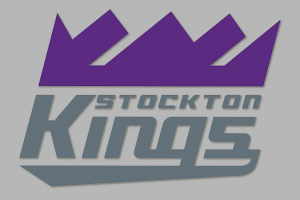 Stockton Kings fans will have an opportunity to preview the team’s player prospect pool at the Sacramento Kings California Classic summer league – July 2-3 and 5 at Golden 1 Center. The Sacramento Kings, Golden State Warriors, Los Angeles Lakers, and Miami Heat – will play six games featuring rookies selected in the 2018 NBA Draft, sophomores and athletes competing to make NBA and G League regular season rosters. In late summer following NBA training camp, the Stockton team will host open tryouts for aspiring players. The team will form its roster following the October NBA G League draft and training camp, with season play beginning in early November. “With the addition of NBA G League Basketball in the Central Valley, each of California’s NBA franchises have a powerful asset within an hour of their headquarters to help develop their players and expand their fan bases with elite professional basketball at an affordable price in a fun, family-friendly atmosphere,” said NBA G League President Malcolm Turner. The basketball operations staff will operate in Sacramento at the former Sacramento Kings Training Facility in Natomas, with access to the full resources of the Sacramento Kings including Golden 1 Center. Team business operations will be led by current Kings G League Vice President of Business Operations Dustin Toms in offices located in Stockton, with the full support of Kings business operations teams. The team’s new website, StocktonKings.com, and social channels – Twitter, Instagram, and Facebook – were launched following the Stockton City Council vote. 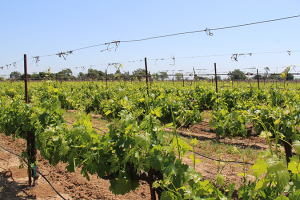 Farmers nationwide are feeling the effects of new tariffs announced by China on April 2, but California growers have been hit the hardest. 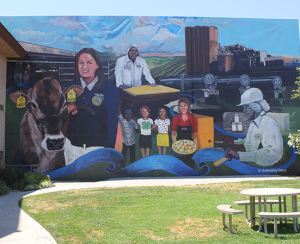 Secretary of the California Department of Food and Agriculture Karen Ross met with local farmers Thursday in Lodi to highlight just how devastating the roughly $500 million in new duties on the nation’s agricultural goods is to the state’s economy. On March 8, the Trump administration announced global steel and aluminum tariffs to protect U.S. producers, exempting many nations – but not China. 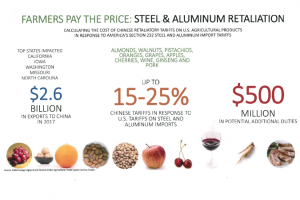 The country fired back at America by levying 12 to 25 percent tariffs on $3 billion worth of American goods, including scrap aluminum, frozen pork, dried fruits, nuts and wine. The tariffs greatly impact California’s almond, walnut, wine, cherry and many other commodities, increasing the cost of exportation, depressing the prices of farm futures and harming trade relationships that have taken decades to develop. California Agriculture Secretary Karen Ross talks about how free trade is essential to the wellbeing of the state’s — and nation’s — economy during a press conference held by ag leaders on Thursday to discuss the Trump administration’s global steel and aluminum tariffs and China’s retaliatory tariffs on U.S. agricultural products. Ross, along with California Farm Bureau Federation President Jamie Johansson and Farmers for Free Trade Executive Director Brian Keuhl, spoke about the tariffs with Aaron Lange of LangeTwins Family Winery and Vineyards, Lodi Farming Company President Jeff Colombini and California League of Food Processors President and CEO Rob Neenan at LangeTwins on Thursday, where each shared how the tariffs will affect a state that exported more than $2 billion in agricultural products to China in 2016-2017. 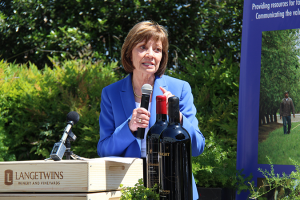 Lange shared the immediate impacts of the tariffs on his winery, which, when announced, resulted in an importer from China cancelling an order. “It was a small order, but it was the beginning of a new relationship with an importer in China and it was cancelled almost immediately,” Lange said. Another, larger order of 700 cases of wine that was set to be sent to China has also been put on the back burner, he added. “That’s been put on hold to try and negotiate who is going to pay this extra 15 percent, and right now, I guarantee you it’s going to be coming partly out of our pocket to make sure we can maintain access to the China market,” he said. The crops that will be hit the hardest include almonds, which could face an additional $28 million in duties, walnuts, which could see a $4 million increase in duties, pistachios, with a whopping $99 million in potential additional duties and wine, which would receive $29 million in additional duties. Also affected in California are oranges, grapes and apples, the latter of which could face up to $8 million in potential additional duties. Colombini, who farms apples, shared not only the affect the tariffs could have on supply issues, impacted if there is an excess of apples in the country after being unable to find trade partners overseas, but also the impact on the people living and working in the ag industry in California. Free trade is essential to the success of our agricultural economy, each speaker argued, and Keuhl pointed out just how vital trade is to the livelihood of each individual farm in not just California, but the entire country. 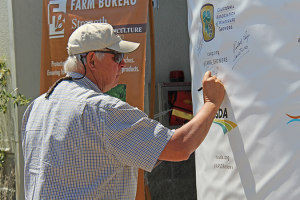 Bill Berryhill, chair of the California Association of Winegrape Growers, signs his name to a banner supporting free trade. U.S. Agriculture Secretary Sonny Purdue reassured farmers last week that President Donald Trump will not leave them to take the brunt of China’s retaliatory tariffs and said the USDA and the administration are working on solutions to market issues. To those who spoke in Lodi on Thursday, the issue is not a complex one: Put farmers first, said Keuhl.